This page is about the Russian fighter Yak-3. For other uses, see Yak-3 (Family). The Yak-3 is a rank III Russian fighter with a battle rating of 4.0 (AB/RB) and 4.7 (SB). 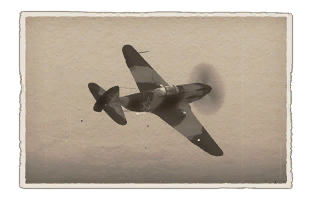 This aircraft has been in the game since the start of the Open Beta Test prior to Update 1.27. 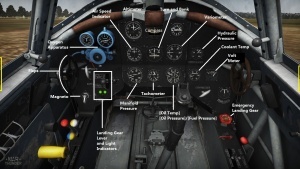 By the time you get this plane, you should be well versed in the rules of Yakovlev warfare: Engine throttle at about 90%, stay below 2,000 m and watch your ammo. However, the Yak-3 is a true gift to Soviet pilots: while peak performance is still at or below 2,000 m, going above up to 4,000 m is now possible! Energy fighting, while not the Yak's speciality, can also be done effectively with the Yak-3, and moderate BnZ can be allowed due to metal wing construction (wings take more to rip now). While engine throttle should still be at 90% for max engine cooling, once upgraded, you should never have to throttle lower than this on this plane. In addition, WEP is moderately effective now and does not overheat the engine as fast as previous Yaks! The guns on this plane are worth noting as well. Along with the effective and feared 20 mm cannon in the nose, the Yak-3 gains two additional 12.7 mm MGs. This means that the cannon is no longer your only real weapon. Dual .50s can wreak impressive havoc at close range, and compliment the cannon well. The cannon also gets an improved belt: Air Targets. While not having as much HE as the Ground Targets belt (some pilots will, justifiably, prefer the GT belt), it contains more incendiary rounds. The Stealth belt is still a solid choice for those who are used to the trajectory of the cannon. Find the belt that suits you. The Yak-3 sports 2 x Berezin UB 12.7 mm MGs, which are arguably the best 12.7 mm weapons in the game besides the M3 Browning. These run dry at approximately the same time as the 20 mm ShVAK cannon. The ShVAK sports inferior ballistics to those of the MG 151 and especially Hispano cannons, closing to short range before firing is recommended. Being hub mounted, the ShVAK can utilize its hefty firing rate advantage that it holds overall 20 mm cannons in the game (with the exception of the F-86F-2's T-160s). The Yak-3 carries 150 RPG for the Berezin UBs and 120 rounds for the ShVAK, which is a below average load. It is imperative that you fire short bursts and save your ammo until within 400 meters for maximum effectiveness and longevity. This weapon set is more than adequate for fighter vs. fighter engagements, but you will notice how lacking the weapons are vs. dual and quad engine aircraft. The lightened airframe of the Yak-3, being propelled by the more powerful Klimov VK-105 engine, gives the aircraft very good acceleration properties and a good rate of climb. It is also very agile, especially at low altitudes. However, while the Yak-3 is one of the best low-altitude dogfighters, its high-altitude performance still leaves much to be desired. The aircraft should always be kept below 4 km altitude to maximize its strengths. The Yak can also be used as a Boom & Zoom aircraft, however, due to low wing endurance, it is advised to always control the speed of the dive and not use excessive force to pull out of it. The Yak-3 is the pinnacle of the piston engine Yakovlev design, with a much more powerful engine, the addition of a second MG (meaning the MGs are viable now! ), and metal wings! The coolant system, now actually somewhat effective, has been moved to the wing roots (no "smiley face" below the nose), making the plane more streamlined. The cannon - the same old 20 mm ShVAK - receives a pleasant upgrade: an effective Air Targets belt. Overall, the Yak-3 can be considered as a "jack-of-all-trades, master-of-none" aircraft. It will readily fulfil any fighter role a pilot will put it in, however, it won't excel in any – the American and German aircraft will still be better at energy fighting and executing Boom & Zoom tactics, while the British and the Japanese planes will still have an edge in manoeuvrability. Yet, the Yak-3 is a very potent machine which, with a skilled pilot behind the controls, is an opponent that you don't want to underestimate. Baiting higher enemies into lower altitudes and engaging them in a dogfight is a worthwhile tactic. The only exception to this is Japanese opponents and certain Spitfire variants, where strict energy fighting or Boom & Zoom is recommended. The Yak series also works oddly well at medium altitude "Boom & Zoom", thanks to a clean low drag airframe (good horizontal energy retention) and good vertical manoeuvrability. High acceleration and top speed, especially at low altitudes. Dual Berezin UB HMG's with upgraded belts are capable of doing good damage. Still confers to the standard Yak setup of 1 x 20 mm ShVAK with one/two MGs, which is underwhelming at this tier. 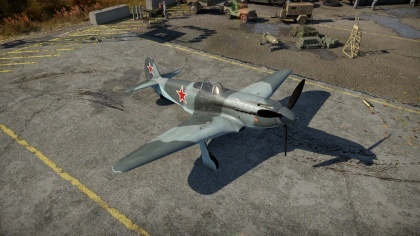 Upgraded Yak-3s can still have engine overheating problems! The idea to produce a new fighter for the Red Army Air Force went as far back as 1941. It was then that the Yakovlev Design Bureau presented the I-30 prototype, intended an alternative to the earlier Yak-1 design. However, the German invasion of the USSR, as well as aluminium shortages, meant that the project had to be put on hold. Yakovlev resumed the development in 1943 while working on an upgraded version of the Yak-1 fighter. This time, it was decided that a new aircraft should be produced to completely replace the Yak-1 and Yak-7 models. The new machine was dubbed as the Yak-3 and entered service with the Red Army Air Force in 1944. The new fighter quickly became very popular with Soviet pilots. They highly praised its solid armament of two Berezin UBS 12.7 mm machine guns and one ShVAK 20 mm cannon as well as ease of piloting and superb low-altitude performance. Marcel Albert, the top scoring French ace of World War II, cited the Yak-3 as one of the best fighters of the war, along with the P-51 Mustang and the Supermarine Spitfire. After the war, the Yak-3 was also used by the Air Forces of Socialist Yugoslavia and Poland. The Yak-3P was produced from April 1945 until mid-1946, armed with 3 × 20 mm Berezin B-20 cannon with 120 rounds for the middle cannon and 130 rpg for the side weapons. The three-cannon armament with full ammunition load was actually 11 kg (24 lb) lighter than that of a standard Yak-3, and the one-second burst mass of 3.52 kg (7.74 lb) was greater than that of most contemporary fighters. Starting in August 1945, all Yak-3 were produced in the Yak-3P configuration with a total of 596 built. Yak-3 (Family) - The rest of the Yak-3 family.